In an attempt to control frequent flooding in the natural floodplain areas of the lower Barak plain, several proposals for harnessing the Barak river have been raised within government and political circles since India’s pre-independence days. In 1954, the Assam government requested the Central Water Commission (CWC) and the planning commission of the union government to identify a suitable location where monsoon waters of the Barak could be impounded to form an artificial flooding zone (Brahmaputra Flood Control Board, 1984). Accordingly, the North Eastern Council (NEC) entrusted the investigation work to the CWC. The CWC submitted its report in 1984, which proposed the construction of the Tipaimukh High Dam (THD) at a cost of Rs.1,078crores (WAPCOS, 1989). However, the report was turned down due to the lack of a proper environmental impact assessment of the submergible areas. Again, in 1995, at the request of the NEC, the Brahmaputra Flood Control Board prepared the Detailed Project Report. There was no progress after this. Finally, in 1999, the Brahmaputra Flood Control Board handed over the project to the North Eastern Electric Power Corporation Limited (NEEPCO). On January 18, 2003, the project received the all- important notification under section 29 of the Electricity Act. Recently in July and August 2013, there were two separate attempts by the Ministry of Environment and Forest (MoEF), Government of India to accord Forest Clearance for the controversial project for forest impacts in Manipur and Mizoram side. In the consideration for forest clearance for the proposed Tipaimukh Multipurpose Hydroelectric project for forest impacts in Manipur side, the meeting of the Forest Advisory Committee (FAC) of the Ministry on 11-12 July rejected the “Forest Clearance” for the proposed project. In another sinister design to create more confusion among communities affected by the proposed Tipaimukh dam, another round of meeting is scheduled on 13-14 August 2013 by the MoEF to consider according forest clearance for impacts on Forest on Mizoram side. Interestingly, the Additional Chief Conservator of Forest for the Government of Mizoram has recommended diversion of 1551 hectares of forest land in Mizoram side and wrote to the MoEF on 16 January 2013 for necessary diversion. The area to be submerged in Mizoram side is rich in forest biodiversity and is also used for indigenous agricultural system by the Hmar people of Mizoram. The project envisioned a 390 m long, 162 m high earthen-rock filled dam across the Barak, 500 m downstream after the confluence of the Tuivai tributary and the Barak on the Manipur-Mizoram border. The dam will be at an altitude of about 180 m above mean sea level, with a maximum reservoir level of 178 m. It was originally designed to contain flood waters in the lower Barak valley, but the component of hydropower generation was later incorporated into the project. It will have an installed capacity of 6X250 = 1500 MW, and a firm generation of only 412 MW. The dam will permanently submerge an area of 275.50 sq km (NEEPCO, 1998) and is feared to have negative impacts over an area of 9,126 sq km in the state of Manipur alone. A large number of indigenous communities, mostly belonging to the Zeliangrong and Hmar peoples, will be permanently displaced and deprived of their livelihoods. Since there was no comprehensive study that focused on biodiversity, environment, health, human rights, socio-economic and hydrological impacts of the proposed project and geo-tectonic problems, the communities from Manipur have resisted the THD for more than 15 years. The absence of meaningful consultation (that could lead to free, prior and informed consent) with the indigenous people contradicts the keystone of strategic priority developed by the World Commission on Dams, that no dam should be built without the demonstrable acceptance of the affected people, and without the free, prior, informed consent of indigenous peoples as also outlined in the UN Declaration on the Rights of Indigenous Peoples. Now the struggle against THD is no longer confined to Manipur alone, but has also spread in the downstream areas including the lower Barak Valley and Bangladesh, where the immediate negative impacts of the dam are feared to be felt. The dam may also impact watersheds and ecosystems in north-western Burma. As learnt from the experience with other projects, dams have already created or exacerbated ethnic conflict. In the case of Tipaimukh as well, there are already divisions along ethnic lines that can have long-term implications for everyone. In an already fractured society such as the north-east, it is imperative that the state does not allow projects that widen the ethnic divide. In addition, conflict with other states and with Bangladesh due to the dam cannot be ruled out and will need to be addressed before deciding on the project. Further, there is no clarity about its scientific and technical feasibility, environmental impact assessment, rehabilitation policy and safety for downstream communities, which has created enough ground for a major conflict and raging controversy around the THD. The proposed THD site and its adjoining areas are predominantly composed of the Surma group of rocks characterised by folds and faults with a regional strike of North-northeast- South-southwest (NNE-SSW) (Ibotombi, 2007). The entire locality has well-developed fractures and hidden faults called blind thrusts. These thrusts could be potential earthquake foci (Ibotombi, 2000). 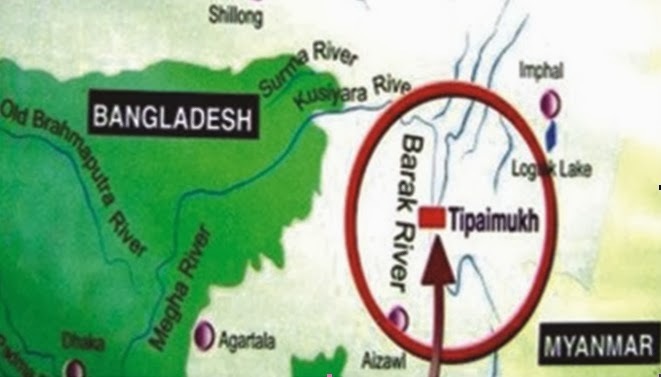 Also, the course of the Barak river opposite the Tuivairiver itself is controlled by the Barak-Makru Thrust. The entire drainage basin of the Barak is littered with fault lines that control the courses of the river and its tributaries. The proposed THD dam axis is located on the Taithu fault (24o 14N and93o 1.3 E approximately). Such faults are potentially active and may be the foci and/or epicentres for future earthquakes. The plate kinematics of the region is very active (Ibotombi, 2007). Boundary interaction (seduction zone) between the Indian and Burmese plates makes the entire region highly seismically active. North-east India is one of the most earthquake prone areas in the world. Earthquake epicenters of magnitude 6M and above have been observed during the last 200 years (Verma and Kumar, 1994). Within a 100 km radius of Tipaimukh, two earthquakes of +7M magnitude have taken place in the last 150 years. The epicentre of the last one, in the year 1937, was at an aerial distance of about 75 km from the dam site in an east-northeast direction. The project report (1984) states that as per the Botanical Survey of India, there is no threat to any endangered plant, and that they have not come across any rare endemic taxa or species of aquatic plants during their survey. The same report also states that as per the Zoological Survey of India, there are no endemic and endangered fauna in the area. The references relating to the flora and fauna in the proposed THD area do not seem to be based on factual and authentic field information and have been contested. The Barak basin, along with the rest of north-east India, is part of the sensitive Indo-Burma biodiversity hotspot, identified on account of its gene pool of endemic plants, animal species, and microbes. The absence of important information about the biodiversity of the region in the project report apparently reflects a sense of deliberate negligence and lack of seriousness in carrying out the environmental impact assessment of both the upstream and the downstream areas. The Barak basin drains a region that the international scientific community has acknowledged for its bio-researches, and as such, is of immense significance for the country and, indeed, the planet. Today the world is seriously concerned about the impact of global climate change, and the percentage of emission of methane gases by the creation of artificial water reservoirs for big dam. It implies that dammed reservoirs are the largest single source of human-caused methane emission, contributing a quarter of these emissions. A total of 25,822 hectares of forest land of Manipur will be affected by the Tipaimukh dam which will lead to the felling of 7.8 million trees, and such action will seriously contribute to climate change, both locally and globally due to the destruction of the absorption capacity of Green House Gases and also due to emission by the proposed reversion of the dam. According to the Department of Forest, Government of Manipur, five species of hornbill are reported from the proposed THD area: the Great Indian hornbill, the Indian Pied or Lesser Pied Hornbill, the Wreathed Hornbill, the Brown-blacked hornbill and the Rufous-necked Hornbill. The prime hornbill habited area in the Tipaimukh region is located just above the sharp south-north ‘U’ turn in the Barak river (where the river bends sharply north from Tipaimukh in Churachandpur district to enter the Jiribam sub-division). The dam site is located exactly at this sharp bend. The project report makes no mention of national parks or sanctuaries in the submergence zone, while there are, in fact, two very important wildlife sanctuaries i.e. Kailam and Bunning. Further, there are a number of wetlands unique in nature, as well as several waterfalls in the submergence zone. The Barak basin area is one of the most Important Bird Areas (IBA) in the Sino-Himalayan temperate forest, the Sino-Himalayan subtropical forest and the Indo-Chinese tropical moist forest. More than 200 endemic fish species have been recorded from the Barak drainage system. Over and above this, the wetland complex and its biodiversity catering to the continuation of the civilisation in the Sylhet district of Bangladesh should not be overlooked. Given these loopholes, it is obvious that these sensitive issues have generated a series of conflicts related to different aspects of the proposed THD.